If you’ve read the free basic PDFs for 5th Edition and didn’t like it, well there’s nothing in the new PHB that will change your mind. It basically just adds a few new races, several new classes, and feats. I do like the way feats are handled. 5th Edition feats are more robust, more like plugging in optional class abilities as compared to the relatively fiddly, minor tweaks granted by 3E/4E/PF feats. Of course, you get far fewer feats in 5E than you do in previous iterations. But if you can live without the extra bells-and-whistles (or just don’t like 5E) there’s no reason you need to pick up the PHB. I gave the new Basic DMG PDF a quick look through. It weighs in at about 60 pages, and contains a decent selection of monsters, some common NPCs (thankfully in a separate section, so they aren’t mixed in with the monsters) and a few magic items. There’s also a few pages on building encounters, though no guidance on how much treasure to give. 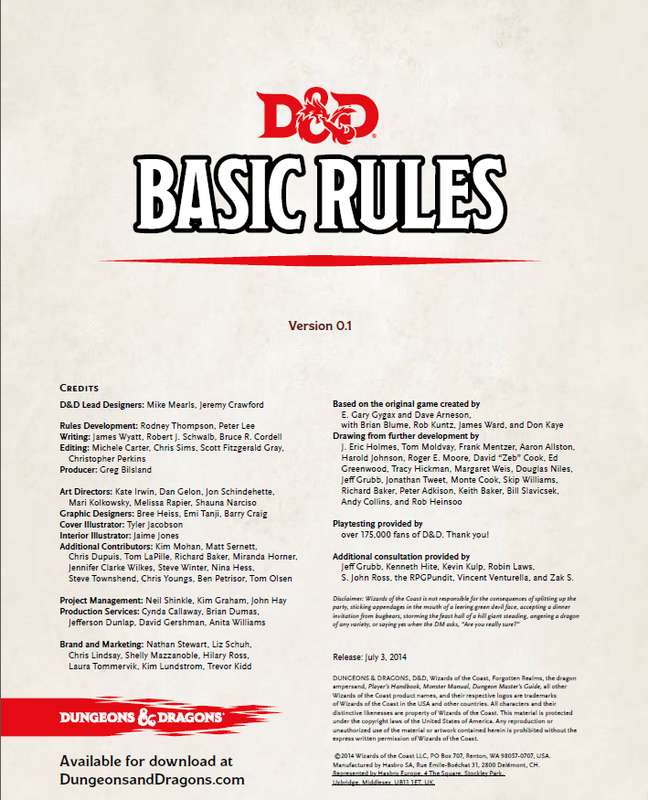 Between the two PDFs you ought to be able to run a ‘basic’ game of 5e now. One neat thing, certain powerful monsters can have Legendary actions and Lair actions. These are additional actions the monster can take under certain circumstances. For example, an Adult Red Dragon can make a wing attack after another character completes an action; likewise, the dragon can use special ‘Lair’ actions while in its lair, such as magma eruptions or clouds of noxious gas (while the game expresses this as an action taken by the dragon, it is perhaps better to think of them as environmental effects of the dragon’s preferred habitat). This is a neat way to represent the awesome power of a powerful dragon, like Smaug. According to the basic rules, characters can now ‘auto’ detect magic items, and determine how they work with just a short rest. Definitely not happy about that, but it’s something easy to change with a house rule. Some items require attunement to use (such as Gauntlets of Ogre Power, for example), and a character can only use 3 attuned items at a time. This is a neat, simple way to limit the number of items a character can use, though I’m sure the full DMG will change it (when it’s released in a couple of months). And for what’s it worth, the new version of the Player’s PDF just seems to add Forgotten Realms deities and factions. There may be some other corrections and changes buried in the text, but I haven’t given it a thorough lookover. 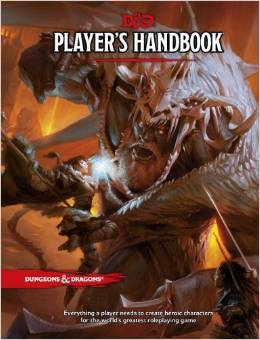 You probably already know about this, but I need some blogging fodder, so here it is: WotC released a second version of the Basic 5e D&D Player’s PDF, and a new Dungeon Master’s PDF. You can get them both here. Haven’t read them yet, but I probably will later today. Cheers. I’ve had an opportunity to look over three of Paizo’s new campaign books that introduce science-fiction concepts to Pathfinder. The books in question are: 1) The Numeria campaign guide, 2) People of the Stars and 3) the Technology Guide. For the most part I think these books can be used with the Beginner Box with minimal work, so I’m not planning on doing a PFBB conversion for any of them. The Numeria campaign setting introduces a new area of Golantha(sp?) where a giant space ship crashed eons ago, depositing advanced technology all over the place. It’s a solid Sorcery & Super Science setting for those who want to play a science-fantasy flavored version of Pathfinder. It offers up new sci-fi themed monsters (i.e. robots, cyborgs), rules for radiation, a mutant monster template that could probably be converted into a PC race fairly easily, and some interesting settings. However, it lacks information on actual technological items and the adventure locations, while evocative, are not ready made for running adventures (I assume the Iron Gods adventure path will fill in the blanks). People of the Stars is more suitable for running a Spelljammer version of Pathfinder, though it does provide rules for an Android player-character race. It’s more fantasy-in-space than science-fantasy. The most interesting book, to me at least, is the Technology Guide. It provides the missing technological items for the Numeria setting, and provides additional rules for cybernetics, artificial intelligences and new feats, skill uses, archetypes and the Technomancer prestige class. It’s also a great resource for running a straight-up post apocalyptic Gamma World-esque flavor of Pathfinder (in other words, the Omega Box project I’ve been working on since, well, forever), or even a Pathfinder flavored version of Shadow Run. One thing I really like is that technology, while superficially similar to magic in many respects, still has its own niche. Paizo didn’t take the easy path and just model all the tech off of existing spells or magic items. Most of the tech weapons are fairly inline with standard weapons, though they have additional concerns, such as requiring power to operate (also, timeworn items can glitch, though this is additional complexity I’d rather not deal with). For example, a laser pistol does 1d8 fire damage. It also has a few other twists to make it unique, but overall a laser pistol isn’t too much more powerful than a revolver or standard magic weapon. Heavy weapons have more punch, and the Death Ray is just nasty, but for the most part you don’t have to worry too much about tech weapons outshining normal weapons. 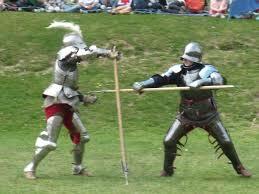 As with weapons, armor is not significantly more protective than standard armor. The main difference comes with special functions: Chameleon armor, for example, provides a Stealth bonus; HEV armor protects against radiation and toxins; Space Suits protect against vacuum; etc. But you won’t find a suit of super-duper battle armor that grants a +12 AC bonus but only counts as light armor. Again, everything fairly balanced inline with magical armor, but still with its own niche. You might think pharmaceuticals would just be a high tech version of a potion, but again Paizo avoided just a copy-and-paste of potions. Pharmaceuticals have unique roles, different from potions. For example, you’ll find a drug that grants a Fast Healing effect, but you won’t find one that acts just like a potion of healing. Reading this section gave me flashbacks to Shadow Run, and with a bit of work you could create a workable fantasy-cyberpunk flavor of Pathfinder, if you’re so inclined. Each implant takes up a specific body location and has an Implant value. The total value of all implants cannot exceed the character’s Constitution score or their Intelligence score (reflecting both physical and mental limitations of the body’s ability to control cybernetics). Also, implanting cybernetics is a fairly risky and arduous process that causes Constitution ability damage, so it’s not for the faint-hearted. I think this section could be used to add an interesting Cyborg class/race option to a post-apoc version of the game, but it felt a bit too much like chrome-and-polish cyberpunk for my tastes. But, YMMV. So, for my purposes, there’s a lot of interesting information here for the Omega Box project. The android race is an excellent addition, and I can use the cybernetic rules to work up a workable cyborg ‘race’ option. I’m also thinking of ditching the random mutations and using the rather elegant Mutant monster template as the basis for mutant characters. And there are plenty of useful technological artifacts that can be thrown into the game. However, I think I’d like to stick with the ridiculously high-powered tech weapons from Omega World (Jonathan Tweet) rather than Pathfinder’s scaled-down, balanced weapons. It just seems more appropriate for the beer-and-pretzel style game I want. Also, the radiation rules seem more fiddly than I want to deal with, and the rules for timeworn technology need a lot of streamlining as well, IMO. So, another rambling idea I just had, so I’m kind of thinking out loud here (so to speak). I recently finished Bernard Cornwell’s excellent book Agincourt, which prompted some thoughts about the reality of medieval(ish) melee combat and, more to the point, exhaustion in combat (especially on the muddy fields of Agincourt) and how such applies to D&D. Most editions of D&D have one or more rules about exertion, exhaustion and what not. OD&D, for example, requires a party to rest 1 turn for every 5 turns spent exploring, or suffer a -1 penalty to all checks. I vaguely recall AD&D having a rule about being able to sustain melee combat for a number of rounds equal to a character’s Constitution score before suffering penalties for exhaustion (a rule we never really used, I should add). Most of the time I simply ignore these kind of rules and just play the game. However, I can see a style of game that is very much focused on the details and minutia of dungeon exploration: resource management, time management, mapping, lighting, etc. and, of course, exhaustion. So, as a simple way to track exhaustion, each character is given a number of tokens equal to their Constitution score, representing the character’s stamina. Players surrender one of their character’s exertion tokens every turn spent exploring. Worse, they surrender a token every round of combat. Resting for a short period (1 turn? 1 hour? not sure on this) restores the character’s tokens. A character unable to surrender a token is exhausted and suffers a significant penalty: at least -2, but maybe even -4, to stress the importance of resting and recovering one’s strength, especially after battle. Of course, resting eats up time, bringing more wandering monster checks and the possibility of sudden death with little reward. You can also play around with the mechanic a bit, for example fighting in mud costs 2 tokens per round of combat. Also, spells could drain or restore tokens, or special attacks could reduce exertion tokens instead of hit points, etc. I wouldn’t use such a system in every campaign, but it could play an interesting role in a gritty game of lethal dungeon exploration where mapping, lighting and tracking every resource is vitally important to survival. Thoughts, idea, suggestions, questions all welcome. Cheers. I’ve only recently discovered an old school, pre-RPG style of game called a ‘Braunstein.’ Braunsteins sort of bridge the gap between table top miniatures wargames (think Chainmail) and modern role-playing games. They are typically set up as scenarios with multiple factions and often many players per faction. Each faction has its own agenda or goal and then competes or cooperates with other factions to meet those goals. There’s usually a large play area set up, lots of miniatures (though not as many as a typical wargame) and a neutral GM to adjudicate rules and try to manage the chaos as much as possible. While miniatures and combat is involved (much like a skirmish level miniatures game), players are encouraged to wheel-and-deal to further their faction’s agenda (kind of like a game of Diplomacy). Also, the emphasis is on keeping things simple so that the game doesn’t bog down, always a plus in my book. This is a fascinating style of play to me, and I’d love to run a Braunstein someday…whenever I have enough space to accommodate it, and provided a could interest enough players. I’m already envisioning a post-apocalypse scenario with ragged bands of mutants skirmishing over advanced relic technology, and a more ambitious, ongoing kingdom-level campaign. If you’d like more information, there’s a series of blogposts on Braunsteins at Chirine’s Workbench, the first of which is available here. What are you reading this for? Go see Guardians of the Galaxy…right now!